Posted by Shelley Grell on November 12th, 2014. Swiftpoint Ltd, 12 November 2014 – Swiftpoint announced today that its new generation computer mouse Swiftpoint GT has won the 2015 CES Best of Innovation Award and is immediately available for pre-orders through the Kickstarter platform via www.swiftpoint.com/ks. The announcement was made at the CES Unveiled event in New York. 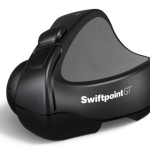 Read the Swiftpoint GT release. Read the coverage: TVNZ One News; FOX News; Idealog; NetGuide/Techday; Business Wire; Geeky Gadgets; TechPP; Tech Dissected; Popist.com; Techwallah.net; and lots more around the world!